The M3007-P is a remarkable 5 megapixel camera from Axis that provides 5 times the resolution of a 720p HDTV camera and 15 times the resolution of a standard analog CCTV camera. When wall mounted it provides an extreme wide angle view of 180 degrees and when ceiling mounted in the center of a room the camera provides a 360 degree field of view. This makes it ideal for small retail outlets with aisles which are normally very hard to cover using standard cameras. The camera has the sophistication to send multiple video streams simultaneously so that you can be watching a 360 degree overview of the room while also being zoomed in on a particular area of interest. “Quad” view mode makes the camera behave like 4 cameras in one, typically covering the room with four 90 degree views, while dual-panoramic view splits the room into two 180 degree wide images. The camera can also be used as a fully controllable PTZ camera, allowing you to take control of the image stream in real-time (although the “zoom” range is far more limited than with a mechanical PTZ camera such as the P54 series camera). Amazingly the camera is able to take what look likes a distorted image of the room in 360 degree view and “de-warp” it so that the image appears normal when zoomed in on a particular area. Keep in mind that the camera is always recording in the 360 degree view no matter what stream you may be viewing live. This means that when you play back the stored video you can still choose to pan-tilt-zoom around the image in any direction you need to! All this plus SD card storage, POE power and a discreet housing disguised as a smoke detector for around $600. 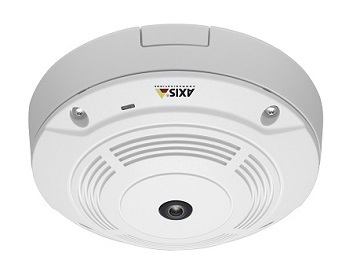 There is also the M3007-PV model which has all the same features however the camera looks more like a traditional mini-dome camera than a smoke detector and includes a vandal resistant housing. The cost is approximately $50 more. Click here to view the Axis M-30 series camera brochure. The two videos below will give you a better idea of how the P3007-P works. The first video shows what the 360 degree overview looks like, while the second view shows the “quad” view stream which de-warps the images from 4 directions and streams them simultaneously. In order to view the videos in full resolution, press the Play button then click on the “Settings” button (looks like a gear cog) in the bottom right corner of the video window and select “1080p” (or higher depending on your monitor’s resolution). Please note that it will take several seconds before Youtube shifts into full 1080p streaming. Lens: 1.3 mm fixed focal length for 360 degree view, or 187 degree panoramic view when wall mounted. Analytics and applications: Video motion detection detection included. Additional analytics and functions available via “Axis Camera Application Platform” programs.